The event takes place in Ljubljana from April 22 to 25 and the Island’s first matches will be against Lithuania and Slovenia. The six-man team for 2015 includes Robin Crease, Ashley Sandyford-Skyes, Dewald Joubert, Patrick Fitzpatrick, Malcolm Levi and Dave Norman. The Isle of Man recorded its best ever finish in last year’s competition in Croatia where they reached 4th place. This equated to a position of 20th out of the 50 European nations. This year’s entry has been possible thanks to sponsorship from Hartford Homes, which is assisting with the team’s travel and accommodation expenses. 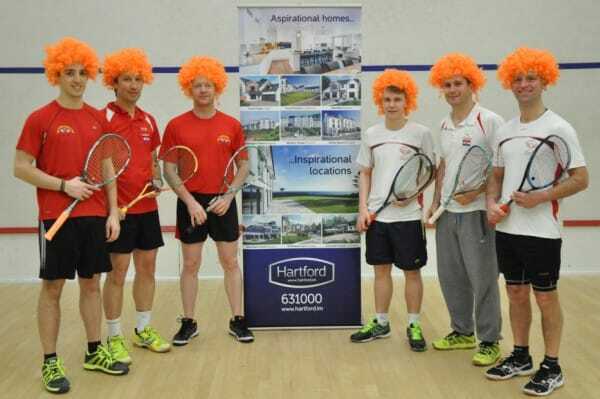 Robin went on to say that he and the team were also pleased to support Orange Wig Day next month (May 15th), a UK-wide awareness day for the allergy and anaphylaxis epidemic. Photo caption: Isle of Man men’s squash team (L to R) Robin Crease, Ashley Sandyford-Skyes, Mike Hayler, Patrick Fitzpatrick, Malcolm Levi and Dave Norman are to compete at European Team Championships 22-25 April.